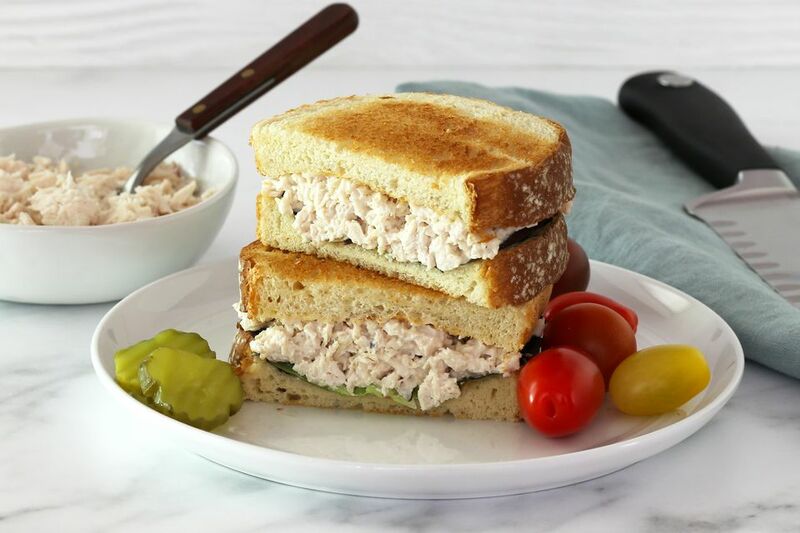 If you are looking for some simple ideas for back-to-school lunch boxes or weekend lunches, this chicken sandwich spread is always a hit. Or use the spread to fill small buns or rolls for a party or gathering. The formula is very basic; it's a versatile sandwich spread that lends itself to all kinds of variations and additions (see below). A store-bought rotisserie chicken is an excellent option to make chicken salad for lunches or sandwiches. Canned chicken is another possible choice, and it's a real convenience for busy days when you don't have time to cook chicken. If you do have a few extra minutes, poached boneless chicken breasts are easy, and they offer fresh flavor. If you prefer a chunkier spread for sandwiches or for serving on salad greens, cut the chicken and any vegetables you add into larger pieces. The recipe makes enough chicken spread for four sandwiches. Mince the cooked chicken finely and put it in a medium bowl. To the bowl, add 1/4 cup of mayonnaise and salt and pepper, to taste. Add extra mayonnaise, as needed, to moisten. Jazz the spread up with a no-salt herb blend, a little garlic or onion powder, or a dash of cayenne pepper. Add 1/2 cup minced celery and 1 tablespoon minced green onion along with the chicken. Add 1/4 to 1/2 cup crisp cooked crumbled bacon. Add 1/2 cup chopped toasted almonds and 1 teaspoon curry powder. Add 1/2 cup chopped water chestnuts and 2 tablespoons low-sodium soy sauce. Add 2 tablespoons minced fresh parsley and 1 teaspoon minced onion. Add 3 tablespoon minced celery and 1 teaspoon dried tarragon (or 1 tablespoon minced fresh tarragon). Before adding the salt and pepper, add 1/3 cup of chopped toasted pecans and 1 teaspoon of Creole or Cajun seasoning. Taste and add salt and freshly ground black pepper, as needed. Place 2 to 4 boneless chicken breasts—about 12 ounces for this recipe—in a saucepan with about 1/2 teaspoon of salt. Add a bay leaf and a sliced clove of garlic, if desired. Cover the chicken with water and bring it to a boil over medium-high heat. Reduce the heat to low, cover the pan, and simmer for about 8 to 10 minutes, or until the chicken registers at least 165 F (74 C) on an instant-read thermometer. Chicken breasts can be dry if overcooked, so start checking right around the 8-minute mark. Remove the chicken from the broth and pat dry with paper towels. Dice the chicken when it's cool enough to handle. Save the broth and refrigerate or freeze it to use for soup or sauce.